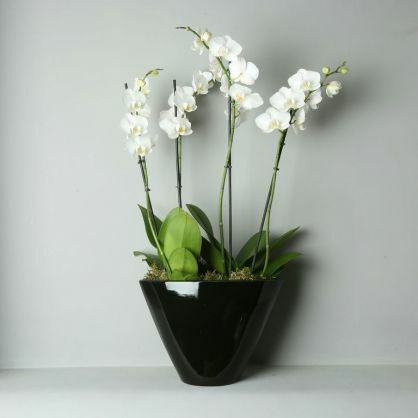 This impressive white orchid planted in a large oval shaped black pot will look magnificent in any home. Approximate measurements 75cm high x 33cm wide. Available for next day delivery only. Please note, Due to the plant being a natural product there will be variations in the number of stems, height and shape of the plant. However their will never be any less than four stems, as shown in the photograph.